It's still hot, and we're finding ourselves doing less and less drum practice as a) it's too hot to work up a sweat shedding and b) we want to be outside, where our neighbours would seriously complain if we set up in the garden. So we got to thinking, how could we drum outside, preferably on the move so no one has time to complain. 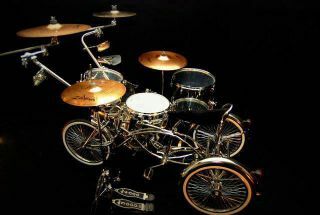 This is a good idea though, drums on a motorbike. Might be hard to drum and steer at 90mph though. This inventive chap turns his bike into a drumset, busks, then turns it back into a bike and rides home. It's sort of like Transformers, only cooler. You may recall Adventure Drums' recent odd video postings concerning Brad's 'abduction'… well, he's back with a new website, new Truth kit and this video that explains it all. Kind of. Italian drummer Fabio Vitiello has tackled Ilan Rubin's drum track on the Paramore Tune 'Fast In My Car'. We like.